I started out, you see, to revisit and reponder the works of several “old” historians – Marc Bloch, R. G. Collingwood, H. Butterfield, E. H. Carr, etc. – the “old men” of history, or better said, the “old (white) men” of the history of writing history. Nearly everyone who’s studied history formally at university probably has read some – or all – of these canonical tomes at some point. Especially graduate students and those others faithfully practicing the art (and science) of history. Or at least they should be familiar with the past of the past. But, as happens, my reading drew me into a meditation on what transpires in historical writing when emotion takes a front seat over logic and analysis, what – if any – benefit there might be to placing emotional rhetoric front and center at Clio’s feet? History seems like a long shiny necklace to me, for I see the decades strung out like beads on a rosary. 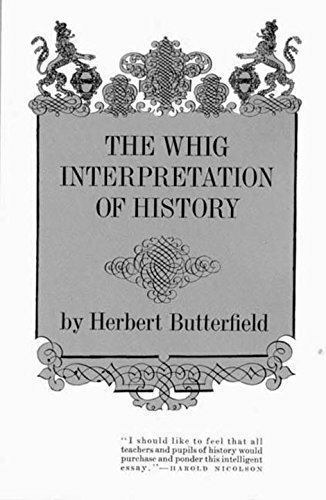 In my earlier days, Butterfield’s work in particular struck me as apt, and his basic philosophy has stuck with me all these years: he believed that 19th-century historians saw certain patterns in history – mostly progressive – and, even when facts or findings contradicted the pattern, these wise men of Clio attempted to squeeze them into the narrative, much as Cinderella’s step-sisters cut off their toes in their eagerness to wear the glass slipper. They ignored the watchword of the historical process – argument – in favor of the standard model, sticking with the system, and making the facts fit, regardless of the cost and the loss of blood. Butterfield thus shook a finger at one of the major fallacies, or failings, of historians. And that is emotional involvement with a topic to the point of not looking over the fence to the other side, ignoring the very essence of the historical process, and fitting the facts to the theory. In short, historians take on moral stances and tend sometimes to look at certain aspects of the past through the lens of the present. A case in point, I would suggest, is the way in which some historians view the situation of servants of every ilk. Nice and noxious and neat. Take the work of another dissenter. Historian David Hackett Fischer, author of the rather systematic-but-intriguing Albion’s Seed (1989), took up questions about fallacies found in so many historical works. Reading his Historians’ Fallacies (1970) almost puckers the mind, because it seems that no historian escapes his scalpel. One of Fischer’s fallacies concerns tautological questions, or “the framing of questions in such a way that they are true by definition and cannot be empirically contradicted without self-contradiction.” (p. 31) The historian in this case develops a theory and sets out to prove it, cherry-picking evidence from sources of every sort. Some historians, however, strongly support the injection of emotion into historical dialogue. Since much of history contains elements of trauma – war, famine, imprisonment, etc., Rüsen brings up the idea of loss related to historical trauma and suggests that mourning plays a role not always recognized by historians. He turns to the idea of ancestor worship, a ritualized transformation, to explain his point, of which he says, “This mental, personal and social practice can easily be applied to history (astonishingly, this has not yet been done).” (p. 48) He does supply a caveat, writing “While I do not think that history today is ancestor worship, it does have some logical similarity with it: we should realize that historical thinking itself, by its very logic, follows the logic of mourning, at least partly in a formal way: it renders the absent past, which is a part of one’s own identity, present again,” an idea he attributes to Frank R. Ankersmit in “The Sublime Dissociation of the Past: Or How to Be(come) what One is no Longer,” in History and Theory 40 (2001), pp. 295-323. It is true, for the most part, until now, that what each generation knew of history came from the pens or the mouths of the winners, the victors. Historians in general no longer practice Thomas Carlyle’s and Georg Hegel’s “Great Man” theory of history, thanks in part to the Annales school of historical practice initiated by Marc Bloch and Lucien Lebvre. But the times in which the historian lives still mold the idea of History and how to write it. It seems that for some, the present provides the only lens he or she holds up to an otherwise blind eye. For people with a vested interest in a certain version of history, those with the need for justification of a point of view, well, this approach is really no different than the very one that Butterfield railed against. So let’s think about food and cooking, something on which these gentlemen did not waste a nanosecond. I’m going to end this brief and incomplete examination of historiography with a real-life example, one that probably very few people living in the so-called West have experienced. And this example will take us back to the days without grocery stores and even before the corner markets of many urban neighborhoods. My point in describing this is to attempt to illustrate just how difficult it is to think about food and cooking in the past, when the lens in which one sees food these days is – for most people, and even those who write about the past – through the present day. When I lived in those several developing countries – Honduras, Haiti, Morocco, and Burkina Faso – places where I ran my own kitchen and cooked most of my own food and raised our son, I had to rethink a lot of things. I learned to live and cook with unsafe water, vegetables fertilized with manure and other things that most Western cooks never have to deal with: flies, and bacteria, amoebas, and giardia. The romantic open-air market, the farm-to-table romance, was anything but. Shopping – going from vendor to vendor, and hopefully finding produce during certain seasons of scarcity – took hours. Haggling over price and then bringing one’s purchases home cost even more time. Nothing was packaged, not cleaned. I, and the servants whom I hired (it was expected of you to hire at least a cook, a housemaid, a gardener, and a night guard), cleaned vegetables, soaking produce in chlorine bleach-infused boiled water; cut up meat and packaged it for use in the next day or so. All water needed to be boiled and then filtered through a ceramic vat with carbon filters. I baked bread several times a week, and in Morocco I went to the miller to pay for him to grind the flour several times a month. And this process repeated itself every day for the water, and at least three times a week for the rest of the food. So when I read about food history, about cooking in the past, and the romantic overtone to it all, I have to laugh. Emotion doesn’t quite tell the whole story. * Practicing History: Selected Essays, p. 37. Romantic, emotional, both the same side of the coin, it seems to me, Merril. What “objective examples” need to be supplied? I see these experiences and the way I described them as objective, the reality of it all was what we had to do make our food safe. The reality was that we had to get our food that way, there was no alternative. I did not discuss my feelings about doing that. I used that as an example of how some people writing about history today might do a few re-enactments, but they don’t have to live like that every day. I did, for years. By doing that, I think I gained at least a partial understanding of what the past might have been like. Perhaps I didn’t make the point I was hoping to make, that we cannot write about food,cooking, servants, etc., through the lens of the present. Trying to get into the minds of people living in 18th century Virginia, on the frontier, for example, it’s easy to assume certain attitudes, mindsets, etc., but since we have never done that, some cannot help but look at certain behaviors in an angry way – e.g., treatment of women, Native Americans, enslaved people – but we cannot really get into the heads of the people there and then. There will always be a caveat, a piece missing, unless we are willing to decide to look at history and historical practice in a different way. I agree that we’re all influenced by when we live, what we know, and our other biases. I’m not certain about your use of the word “emotional.” I certainly agree that there is nothing romantic about cooking in the past, but if you write about cooking in developing countries, aren’t you influenced by your experiences there? And then isn’t that emotional? Or do you mean emotional in that objective examples are not also supplied?